What's cooler than saving a buck by fixing something yourself? A cranking air conditioner in the summer! If your air conditioner is blowing hot air, fixing it with a little help from the auto parts store might be a good idea. These steps will help you know whether you can do it yourself or need a profesional to stay cool this summer. Make sure the car is off and that you wear safety glasses and gloves. First check the cabin air filter. If it's real dirty, your air conditioner can't push cool air into the car. If the air your air conditioner is putting out smells like a gym locker, this could also be your problem. Check the condenser in front of the radiator to see if it's dirty. You should be able to see light through it. Use a hose and some engine cleaner if it's dirty. Check the cooling fan relay to see if it's burned out rusted. 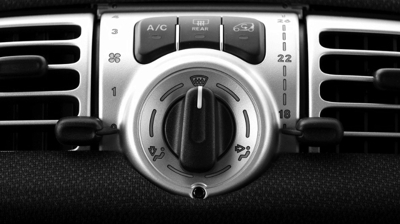 Start your car, turn the fan up all the way and turn the air conditioner on. The clutch on the compressor should be spinning on and off. If it's not, that may be your problem. If none of that solves your problem, you may have a leak or need more refrigerant. When you car's air conditioner isn't working, many friends may tell you that all you need is to add more Freon (refrigerant) to your air conditioner. Be careful because too much refrigerant can damage your car. Try steps 1 to 4 first and you may want to get a quote on getting it repaired at a shop. NOTE: Auto parts stores do sell kits for you to fix a leak and recharge your refrigerant. One of the best products we've seen is air conditioner Pro that adds refrigerant, seals leaks it finds, and has a long flexible neck to connect to hard to reach places. The air conditioner Pro kit also helps you check the compressor. They have video instructions on Youtube at https://www.youtube.com/watch?v=Wn0C9jPOAAQ.